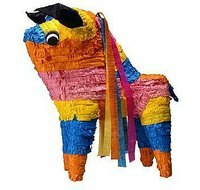 Piñatas can be fun for any party, even adults, but most feel that they are more of a children's activity. They are wrong! Piñatas can be just as fun for adults... It's just all about the prizes! Here are some suggestions to put in an adult piñata! Lottery tickets. Everyone loves the chance to win money. You'll find your guests scurrying about like children under the piñata once they find lottery tickets flowing out! Cash. You don't have to put a ton of cash in, but a few dollar bills will bring a few smiles. Mini liquor bottles. Make sure they're the plastic ones! Remember, they can break! Do your guests have a sense of humor? Condoms/tiny sexual gifts found from stores like Spencer's or adult stores can be quite hilarious for your guests. Make sure you know the humor of your guests first though!!! Keychains. Find humorous or neat keychains to share with your guests. Travel size lotions/shampoos are always a good suggestion. Gift cards. Gas cards, fast food cards, shopping cards... People will be pleased to see them! Chocolates with shots of alcohol mixed in. CANDY!!!! Who says adults don't like candy too? Have fun with your piñata!